Mickey and I went to the game tonight. (The kids stayed the night at Grandma & Grandpa's house. Thank you!) This is the first night game in a long time and it was against a big rival, USC. 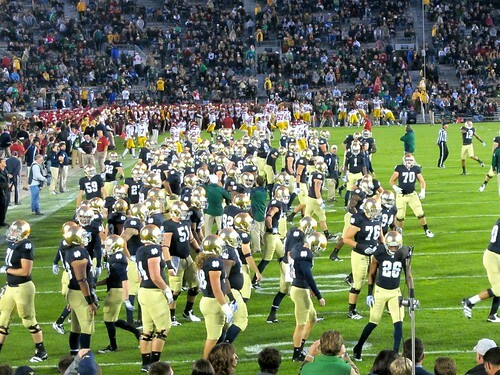 ND had on their new helmets. We couldn't decide if we liked them or not. They were a little blinding under the lights. They looked a little like bling. What do you think? Maybe they were trying to blind their opponents? I don't think it worked. This was not a good game to attend but I'm glad it was me that went instead of one of the kids. I'm not saying that because ND couldn't pull out a win but because of the vulgar and rude mouths sitting all around us. Come on people it's just a game not a life and death situation. Not enjoyable at all. I'm glad I stayed warm (thanks to Amy for letting me wear some of her cold weather clothes) or I would have been totally miserable.